Yesterday Riley did T3 and T4 at the Bucks County Horse Park Tuesday evening dressage show. We went as part of a group, with some other of my trainer's clients, so it was a "hunter style" show, hanging out at the show grounds while the other clients rode. It was a pleasant day but buggy, and the weather was a little unpredictable. Riley was more "up" and distracted than he had been the previous Saturday. Pictured right you'll see he was crabby during the warmup (see video if interested in the whole sequence of misbehavior).There may have been a gigantic fly on him somewhere, we don't know. He's never been so naughty under saddle. The mini-tantrum ended quickly, and in the rest of the warmup and in the actual tests he did very well. 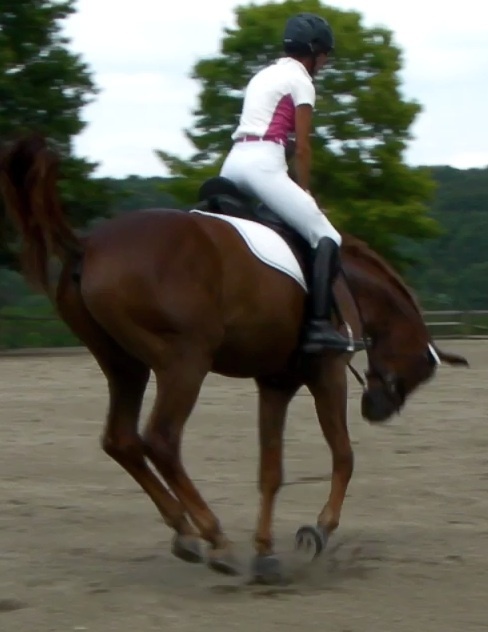 Although he seems a little tense at times, it was a pretty respectable first "away from home" dressage show. There was "buzz" that this judge (an "L" judge) was a tough critic, and I have to admit I was a little taken aback by the Ri's scores -- he was in the fifties for both tests. We left before we had placings -- it'll be interesting to see where we stood relative to other horses under the same judge. A bit surprised that the scores were in the 50's. Riley does go behind the vertical sometimes so if the judge was super picky about that it could affect the scores. Some of those "L" judges can be a lot harsher than upper level judges. If they've just had some kind of training they can be super sensitive to all kinds of standards of quality, etc. It will be interesting to see how Riley's scores do compare. Overall, he had some unsteadiness with his balance, but his gaits looked lovely and the tests appeared to be obedient. Upper 50's, I'd guess?? It would be interesting to see the comments... My guess is the judge dinged a point or two off for each movement where he was a little fussy -- nothing bad, just being a baby, but probably at T3 and T4 they expect to see a steadier contact. My other guess is that for the freewalk and stretchy circles, the judge might expect to see a more forward/downward stretch, with the nose in front of the forehead. This was the biggest constant I heard while scribing for tests with this movement, and I wrote it so much that I wished I had a stamp! I think it will be most telling when you see how he stood compared to the other horses. At my last reining show the judge was tough and penalized us to the full extent of the rule book for every bobble. But he did that to everyone and in spite of there being some very nice horses there, I heard at the end of the day that no horse had managed a 70 in any division. Riley looks like he is progressing really well. Very respectable looking rides for his first time away from home! I didn't look too closely but I think mid-fifties. He got a 4 on his first halt on test 3, which may make sense if the crooked departure was counted, and yes, the stretchiness was lacking in the double-coefficient movements. He got low scores for submission, maybe even a 4 on T3. I listened in on the verbal comments, and the judge seemed very grave, not encouraging, like there were significant problems. She mentioned him being quick and overbent/curled. Awhile back I was at a show that 2 rings going and one judge scoring generously and the other one very demanding. I rode for the latter. A friend was with me and she said that there seemed to be Simon and Paula judging and I had gotten Simon! If I go to a show, I like to try to forget that it's a competition and just show my love for my horse and riding. I respect the judges' comments, but I also try to remember that it is just one day and one ride that they get to see, not the progress or challenges overcome. For example, my horse can stretchy trot to the buckle at home, but in a show I am lucky if I get half that much stretch. At least if a judge is consistent, he or she will be fair to the competitors. I have found that the judges I ride for that are "particular" are more than correct. And yes, they can be strict accross the board for everyone. I have ridden for some R judges and at least two S judges that would have scored Riley in the 50s based on the videos. His gaits are very nice, but he's consistently fussy with contact - that means he's not relaxed. I would guess based on the fussy and the way he's behind the verticle and almost hyperflexed at times, that this is what the judge really had problems with. For training level, remember that one of the goals is acceptance of contact - clearly Riley is not happy with that - he hasn't found the "happy spot" yet. He's young. (shrug) Another sign of this is that his frame is far too upright for true training level work. Test 4 is much better than test 3, but the signs are still clearly there in the curled neck and behind the vertical carriage of his head. My arab can get this way EACTLY (head & neck carriage and fussy) because he's been worked too much with too much contact, and he gets locked in the wither and won't move from hind to front when he goes forward. I'd suggest back to "forward and relaxed" before picking up more than an ounce of contact. Clearly, Riley is a sensitive buggar and this is his way of expressing tension. Scarlett, I don't know, he's pretty steady in his contact at home, and being distracted and fussy at his very first show does not seem like cause for concern to me -- certainly not really a "big deal that needs to be fixed." Draw reins! Perish the thought! I've been impressed with how subtle/passive my trainer is with the reins -- her hands are steady and she pushes him into the contact, letting him have a long, reachy neck. It's more evident in past "working at home" videos than in these.